Toronto furnished apartments are popular for renters who need a short-term place to stay. Since they have been gaining in popularity, it isn’t that difficult to find one. They come in all styles and different qualities. 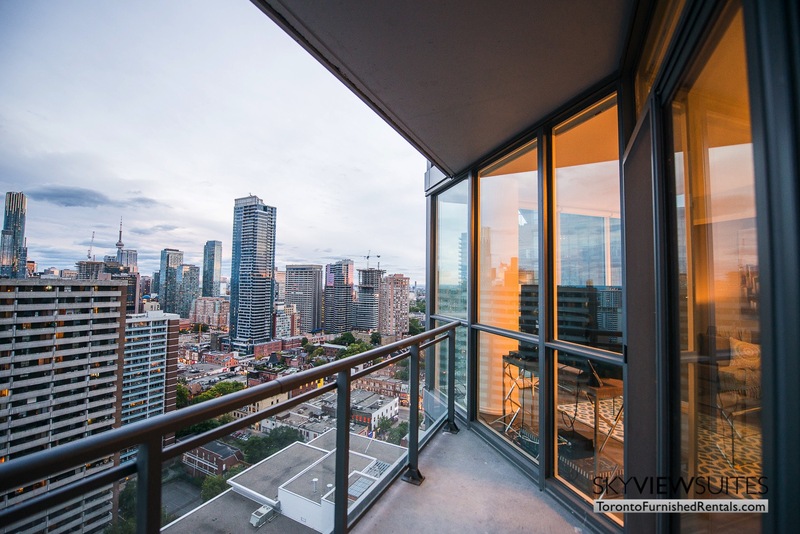 Take for example this fashionable contemporary two bedroom fully furnished unit is approximately 750 square feet. To extend on that, there is also a balcony that overlooks the courtyard and water feature. The wonderfully modern kitchen has a red backsplash as well as granite countertops and opens up to the dining area. The elegant fixtures flow through into the bathrooms; each bedroom has its own. That also includes a queen sized bed, and plenty storage space for all your clothing and belongings. At the same time, there is a resourcefully designed workspace in the main living area which can also double as a study desk or makeup station. The suite is bright thanks to the floor to ceiling windows, and speaking of the floor, the master bedroom is carpeted, however hardwood is the main underfoot material. In the Luna building you will find a vast number of things to do, their amenities are extreme. If you love working out there is a fitness center filled with machines, an aerobics/yoga room and a sauna as well as change rooms. You can take a cool dip in the rooftop pool, or bask in the sun and catch some rays. If you prefer the dark you can watch a movie in the theatre, or play games at the billiards room. A massage and manicure room is also available if you would like to be ready for a private party. You can book the dining room, full sized kitchen and party room as well as guest suites if you wish. Now, for things to do outside there is an island dining area with themed cabanas and connecting rooms. A heated whirlpool, and lap pool with infinity edge are available as well as a waterfall, water steps and an outdoor rain shower, an alfresco bar and urban forest. Luna at Concord City Place is characterized by exceptional resort-style living with amenities that imitate luxury hotels. The locality offers expediency for any sort of stay, from business or pleasure. Famous Toronto landmarks such as the CN Tower and Roger’s Center are a tiny 10 minute walk away. The financial district, fashion district are also nearby. For shopping ease, a full service grocery store is at the bottom of the building. On the other hand, some of the greatest restaurants in bordering King West village are a 5 minute walk away. Some of the best bars are clustered all along the King West street. One of those bars is Bier Market, it carries more than 100 types of beer from over 24 countries and also offers an diverse menu. Brant House is situated just off of King Street, on Brant Street, it’s a trendy bar that converts into an after dinner dance club. Century Room was a warehouse built in 1904 and later restored into a club. There are lots of the historical features to admire at this edifice.